They took Eric while he was changing his battery in his car. Claimed he lived in his car. A few days later they went to 3th Street and took his RV because he was in jail and no one moved it for 72 hours. Saturday they did a sweep of 7th and took Bear and his RV. They also took Elizabeth's RV but do not know if they took Elizabeth but can not find her. The police went to 6th and took the white RV that always parks by Broadway on 6th. Everyday they take 1 to 4 RVs. Very soon there will be no one left. Gentrification is well underfoot in the beach community of Venice, CA and for months now the LAPD has been carrying out a vicious campaign against the homeless and people living in their vehicles. The latest round of attacks is focused on finding an excuse to confiscate any vehicles that someone is suspected of sleeping in. 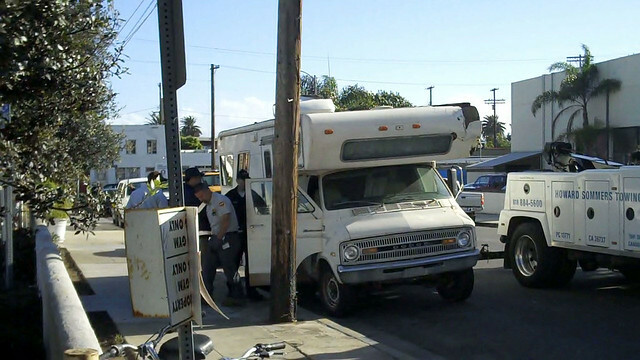 Venice has always tolerated a large population of RV dwellers, it is part of the Venice Beach tradition. Now that the capitalist crisis is forcing more and more people out of their homes and apartments and into their vehicles. The LAPD, under the direction of District Councilmember Bill Rosendahl, has dusted off and started aggressively enforcing a most probably unconstitutional city ordinance against sleeping in a vehicle parked on a city street. These are people that Bill Rosendahal's own Chief of Staff, Mike Bonin has describe as being "one small and fragile step from sleeping on the streets." Now Bill Rosendahl is taking what homes they have and shoving them onto the streets. At a time when our homeless population is already rapidly increasing, the LAPD is specializing in making people homeless. At the councilmember's request, Police Chief Charlie Beck assigned 21 additional officers to the area. LAPD formed a Venice Homelessness Task Force, marshaling and directing resources to focus on quality-of-life crime and direct the homeless to social services. City prosecutors are training cops to build evidence against people violating laws that prohibit living in vehicles. And make no mistake about it, if the only alternative to the sidewalk is your car, van or RV, it's home to you. Once they have taken away people's alternatives the city ordinance says they are allowed to sleep on the sidewalk between 9PM and 6AM. The 21 strong LAPD Homeless Task Force, known in the neighborhood as Rosendalh's goons, are there to make sure no one beds down early and back again at 6AM to ticket or arrest anybody caught still napping. Generally these people, who have been given no place else to go, can also expect a 3AM harassment 'bed check' into the bargain. There are long waiting lists for the beds in the few shelters on the westside, and the winter program that takes people without housing away to someplace warm for the night hasn't started yet. This is how we treat our less fortunate citizens in this time of economic crisis. This is Eric's RV when the police tried to tow it earlier this month while he was working an out-of-town job to earn a little money. He had a friend moving it every 72 hrs. and the friend found this tow truck and police just waiting for the clock to run out one morning. They tried to tow it anyway, and threaten the friend with arrest, but he managed to get them to back off that time. Lisa Green, this November's Green Party candidate to represent Venice in the State Assembly lives in her van. Yesterday she told me she got a ticket for being parked too far from the curb. This is typical of the type of infraction that Rosendalh's goons are using as weapons of home destruction. They write tickets for every little thing, real or fabricated, knowing that the vehicle owner will never be able to keep up. If they had a nice little cash hoard, they probably wouldn't be living in their vehicles. Then they tow the vehicle, or they scream 'hazmat' and tow the vehicle right way. They tow it to a yard far away in the valley, not the city yard close by in the Marina. That no doubt increases the towing charge and makes the logistics of getting the vehicle back more difficult. Meanwhile the storage charges start adding up quicker than the owner can raise funds. That's assuming he or she is not in jail because what the police really like to do is arrest the owner for living in the vehicle. That is how a lot of people are losing their last valuable possession in the world and are being made destitute around here. In one case the police asked a women standing outside her are RV, "Are those your keys?" When she answered "yes" she was placed in handcuffs. 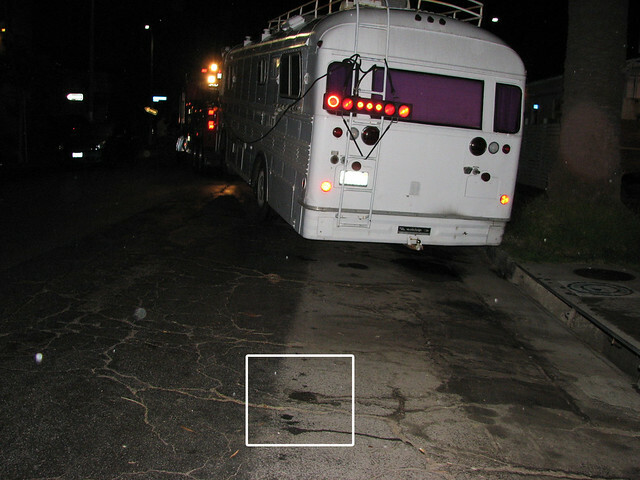 Then they used the keys to enter the RV, took pictures to prove she was living in it. Then they towed the RV and took her to jail. The story I've already heard too many times is the RV was towed, she was arrested and her pets were taken to the pound. They towed Shareen's bus last Saturday night. I was there and saw all. The police tried to stop me from filming, first they threaten me with arrest and made me move way back. Then they kept a bright light on me, even when I changed positions several times, to make filming difficult. They said they were towing the bus because sewage was leaking from the holding tank. I could see some wetness on the ground under the drain valve [see white box in picture above] but I couldn't see any dripping at that time and no smell. The police said that no one had reported it, they just happen to driven by and noticed it. But while I was filming, a woman came by and said that she saw the woman that had reported it messing around the bus and taking pictures before she reported it. Shareen was on a trip when they towed her bus. She is a longtime Venice resident. The bus has for years been parked there on the street in front of the home where her ex-husband and children live. Since their divorce it has been an arrangement to seemed to work for everyone involved. UPDATE: Word on the street is that Shareen got her bus back. I haven't talked to her so I don't know how much it cost her. A civil rights lawsuit has been filed in federal court on November 23 against the City of Los Angeles for violation of the Fourth, Fifth, and Fourteenth Amendments, and the Americans With Disabilities Act. The plaintiffs in this civil rights lawsuit are part of the Venice community. Most are people who have lived in Venice for many years and used to be housed here. They get all their services here, they have been involved in the St. Joseph surveys, they are on housing lists, and they have given their personal information for getting in the “Streets to Homes” program - if it ever happens. Their disabilities range from congestive heart failure, chronic bronchitis, nerve damage, shattered bones, and gout. One of the plaintiffs in the lawsuit is now on antibiotics and complains that she is coughing up blood from a new lung infection. Another plaintiff keeps “NitroQuick” on him at all times in case he feels a heart attack coming on. The list of civil rights attorneys filing this suit include Attorney Carol Sobel, past president and very active member of the National Lawyers Guild, Attorney Barry Litt, a well respected civil rights lawyer known for working on the Pentagon Papers, Attorney Susan Millman with the Legal Aid Foundation of Los Angeles and long time Venice resident, and Attorney Scott Rapkin with the Law Offices of Michael Rapkin in Santa Monica. Submitted by admin on Thu, 12/02/2010 - 13:40. You aren't from around here are you, mate? The thing of it is that Venice Beach has always kinda been those few miles of the SoCal beaches that was open to poor people and had affordable housing. There is also the whole saga of Lincoln Place and the long fight against the low income housing in Venice. Obliviously all the homeless don't live at the beach. You seem to want to send them to the desert. But why do you and Bill Rosendahl think the beaches should exclude the poor? Submitted by admin on Thu, 12/02/2010 - 13:38.
of the poor and homeless in anycase unless you want to do away with them entirely. Far too much is made of this issue by certain haters in Venice and the media has picked up on it because the developers want to kick the poor out of Venice and they have more pull with the media than the homeless.. We do need more public bathrooms for the homeless, and for visitors also in Venice and there are times when RVs have leaked, but no RV dwellers are leaving poop on the streets, especially in the current climate. The city likes to bring out the big hazmat trucks for hours for a little spot or questionable origin like they did for Shareen's bus Saturday night. That way they can stick the owner for a huge cleanup bill. They should bring these trucks out every time a dog pees. I have heard enough stories by now, that I personally believe that someone is setting up RV dwellers and then calling the police. The dump valves on most are external and unlocked and there are people in Venice that want the poor out of Venice at any cost. Submitted by admin on Thu, 12/02/2010 - 13:37. There are a lot of questions about that RV fire. I heard recently about an RV owner being threaten by some people in Venice and told that if they didn't move something bad would happen. Then their RV caught fire. Some people are getting very ugly here. I don't know if this is the same RV that you are talking about, but you seem to blame the RV for the fire, all types of vehicles can catch fire. You are also opposed to any local solution to the sewage problem because that might attract more people. I can only assume that you are opposed to any services for the poor and homeless for the same reason. What you really want is to drive the poor and homeless out of Venice. That is the crocks of the matter. Submitted by admin on Thu, 12/02/2010 - 13:36. 21 extra cops to make one of the Venice city lots available for RV parking and put in a local dump station. They talk about a "Streets to Homes" Program of the future and do nothing. Everybody makes more money this way. The city bleeds these people with there tickets for petty infractions. 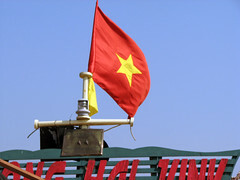 The tow truck and storage lots make out whether the RV is sold or retrieved and the increasing privatized jails are assured of continue growth. That's why the problem is handled the way it is.